With the Apple Watch being delivered fast and furious all over the world, it's time to show off what you got! Post pics and video of your new Apple Watch right here... Let's see 'em! Tartarus, farvardinzad, otta1 and 1 others like this. kataran, Ipheuria, nikkisharif and 4 others like this. 42mm SG sport. Very much worth the money. kataran, Ipheuria, nikkisharif and 3 others like this. kataran, Ipheuria, nikkisharif and 2 others like this. kataran, Dlemos, DarlaMack and 2 others like this. kataran, ladyc0524, mrs_johnson7 and 2 others like this. Finally came around 6:15... Loving it so far!!! kataran, mrs_johnson7 and otta1 like this. blueyz628 and gmabev like this. 42MM sport space gray with black band. It is smaller on my wrist than I expected, can't seem to get the weather data it show up on the watch but other than that I'm loving it so far. kataran, Dlemos and danyeltinajero like this. 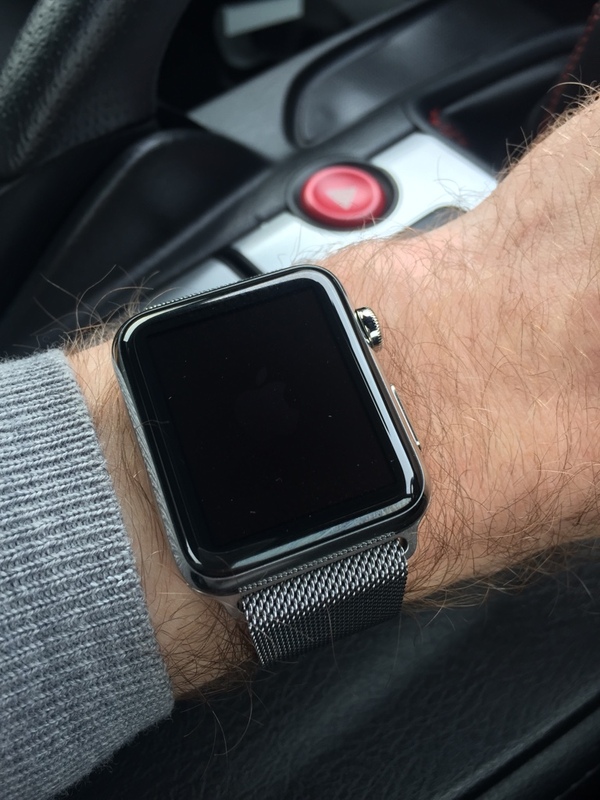 42mm SS with Milanese loop. Right wrist, crown on right. As I've been doing all my life. Dictating texts is really cool. kataran, ladyc0524 and danyeltinajero like this. kataran, ladyc0524, DarlaMack and 3 others like this. shanghaichica, kataran, petvas72 and 3 others like this. Same as the one I'm going to get and you wear it on the same wrist in the same orientation. I'm right handed and I bet you are too. Really diggin' the watch so far. 42mm Sport. ctt1wbw, duke1231, Dlemos and 1 others like this. I'm right handed but wear mine on my left hand. I've always worn my watched on my left hand. Hey, I notice you have the same Jabra headphones that I just ordered. How do you like them? I have ears that reject earbuds so I bought these. They're great. Kinda big, but they stay in place, are lightweight, and very comfortable. Fit my big, goofy ears with no problem. Paired perfectly with the Watch. My ears don't hold earbuds either, but these come with a lot of different bud shapes. I prefer the default large round ones that don't go down into my ear. Let's me still hear everything around me. All these photos are making me want to order one. I must resist! Ipheuria, mmcfly23, purplovher and 4 others like this. Ipheuria, Mscatinboston and rellyrellz like this. They're the Jabra Sport Wireless+. They hang over your ear so the buds stay in place. Perfect for running.